bInterventional X-Ray Innovation (D.R. ), Philips Healthcare, Best, the Netherlands. A, Photograph of the WEB device. B, Corresponding nonenhanced VasoCT clearly depicts the 2 different compartments and the 3 markers (arrows). Central section of the VasoCT conebeam reconstruction of a line-pair phantom. The numbers at the left and right side indicate the line pairs per millimeter. A, DSA before detachment of a WEB positioned in a left MCA bifurcation aneurysm. It is impossible to depict any protrusion of the device in the parent artery because only the 3 markers are seen and the mesh is almost not visible. B, Corresponding unsubstracted image. C, VasoCT confirms correct positioning of the WEB without any protrusion. D, Three-month control VasoCT shows residual flow in the proximal compartment (arrow). 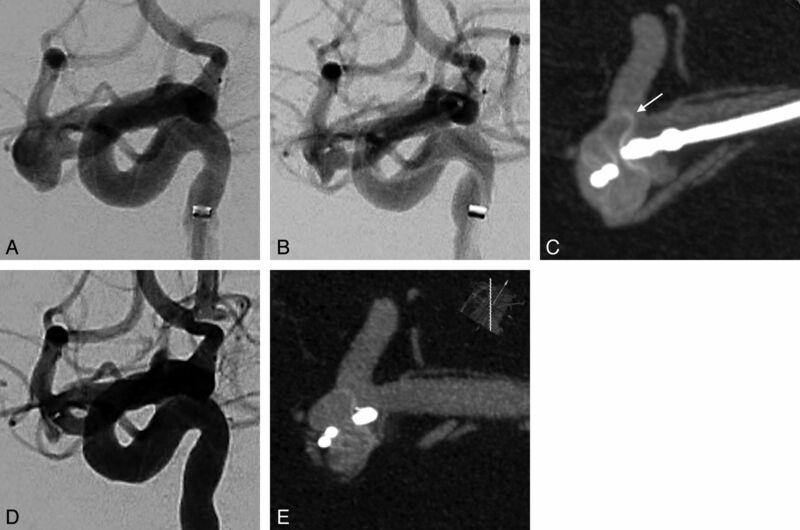 A, DSA of a broad-neck right MCA aneurysm. First, a 7 × 4 cm WEB was deployed. It is nearly undetectable with DSA (B) and there is no flow modification. However, VasoCT (C) clearly shows the device protrusion in the superior bifurcation branch (arrow). Thus, the WEB is retrieved and replaced by a 6 × 4 mm device. D and E, Final DSA and VasoCT after detachment confirm perfect positioning of the WEB without any protrusion. A, DSA anteroposterior view of a basilar tip aneurysm. B, Control angiogram and corresponding unsubtracted view (C) prior to detachment of the WEB. Some contrast agent stagnation is visible in the second layer. 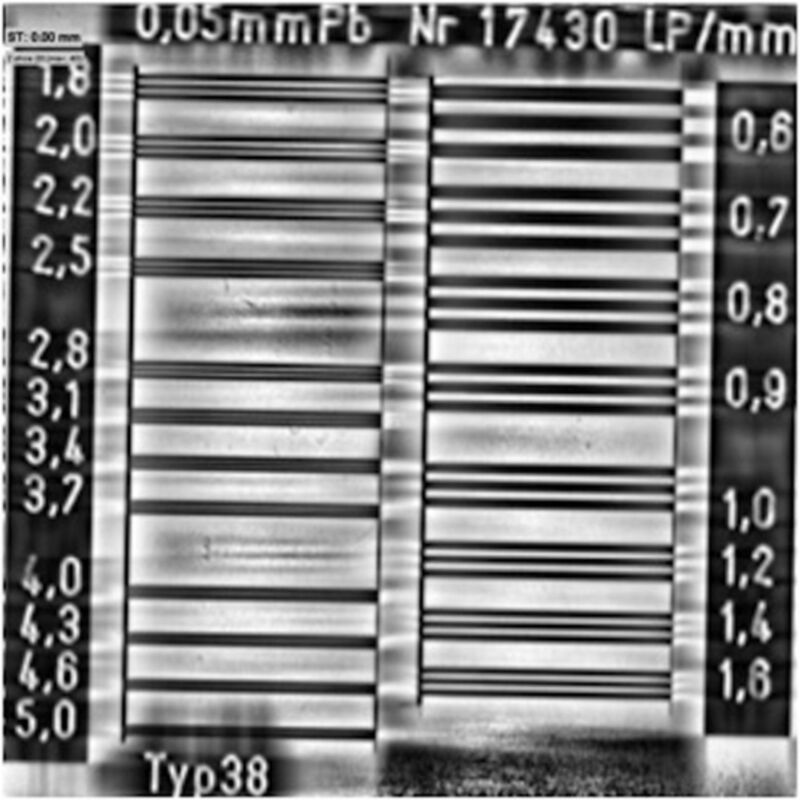 It is impossible to analyze the good positioning of the device; no flow abnormality is depicted in the left P1 segment. D, VasoCT clearly shows the protrusion in the left P1 segment. The WEB was then retrieved and replaced by a smaller one. A, DSA working projection of a large-neck anterior communicating artery aneurysm. B, After placement of a 9 × 7 mm WEB, the control DSA shows the occlusion of the right A2 segment and a narrowing of the left A2. C, VasoCT confirms the occlusion and that the WEB is not properly deployed. It is in a heart-shaped configuration with a distal trough; the 2 distal markers are attached (arrow). This “heart sign” depicts an inappropriate width of the WEB regarding aneurysm dimensions. It was then replaced by a correctly deployed 7 × 6 cm WEB. Nonenhanced VasoCT. It is very important to consider the acquisition plane to avoid the projection of any metal artifacts over the region of interest. 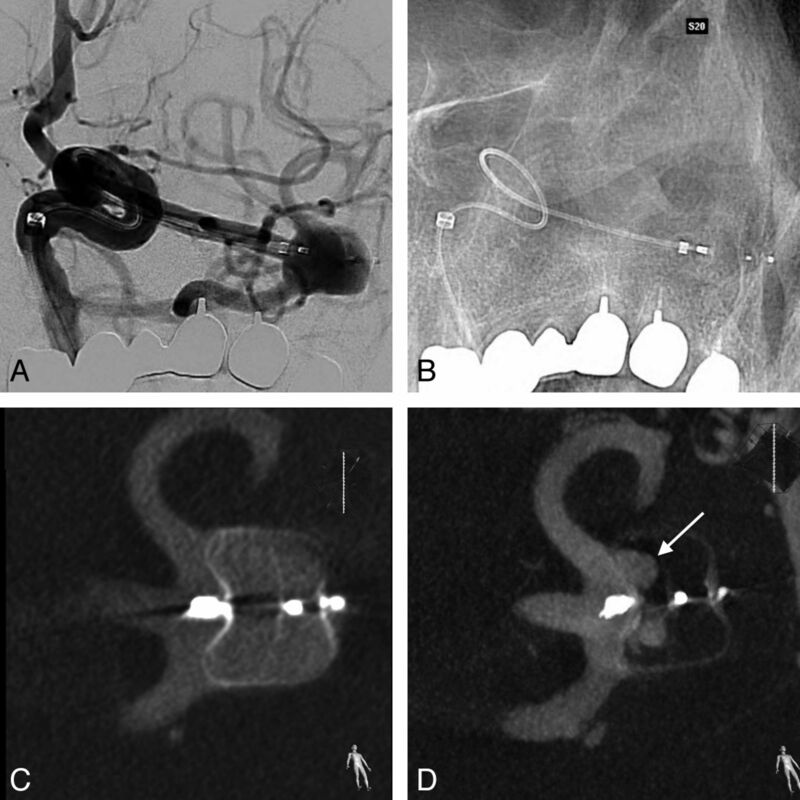 Here, the angulation of the head of the patient was modified so that coil artifacts from a previously treated basilar tip aneurysm do not superimpose on the MCA bifurcation. 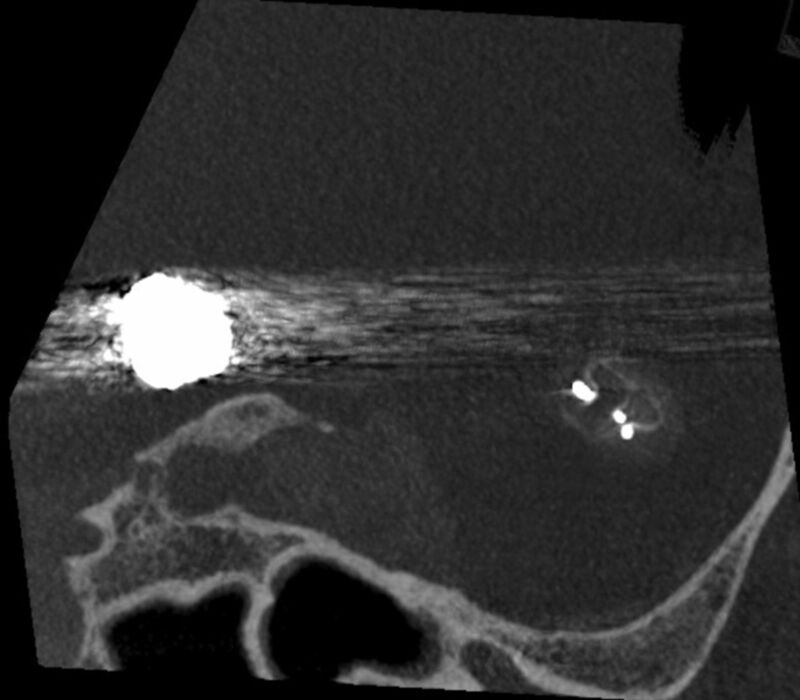 A, VasoCT of an MCA aneurysm treated with a WEB. Marker artifacts are projecting over the parent vessels. B, A new reconstruction with a metal-artifacts-reduction algorithm clearly improves the image quality and the visualization of the bifurcation. Multiparametric MRI of intracranial aneurysms treated with the Woven EndoBridge (WEB): a case of Faradays cage? 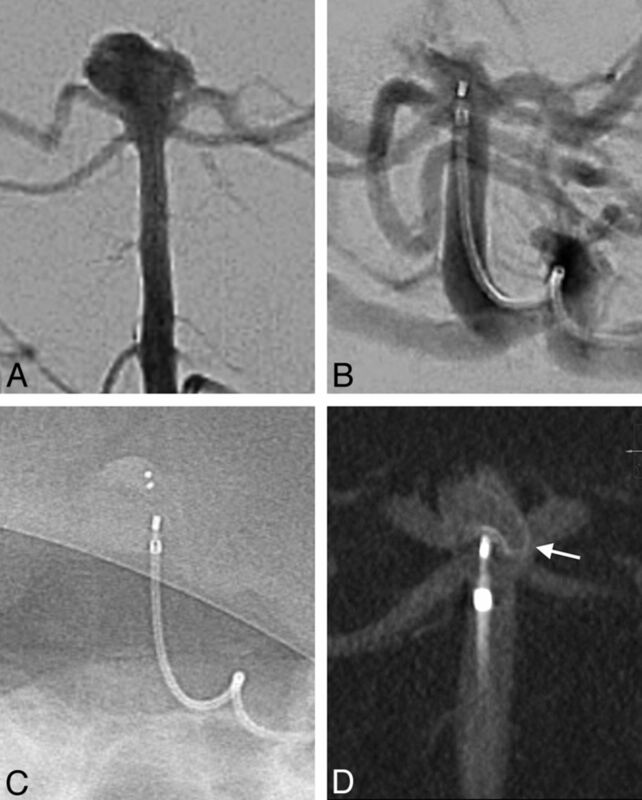 WEB Device: Ready for Ruptured Aneurysms?